Abu Dhabi: TAMM centres in Abu Dhabi are now able to handle at least 246 different services since they were launched last year, offering a seamless experience for those carrying out government or private related transactions. Rolled out by the Abu Dhabi Smart Solutions and Services Authority (ADSSSA), the TAMM portal aims to have all government services made available to both residents and tourists in one place by 2021. Out of the current 246 services provided by TAMM — 141 are local government services, 49 are federal government services, 38 are private sector services and 18 are services for government entities in other emirates. The portal — which can be accessed online, through an application, or by visiting a physical TAMM centre — has also proven to be highly popular among residents, scoring 97 per cent in customer satisfaction surveys. There are currently four centres up and running, two in Abu Dhabi, one in Al Ain and one in Al Dhafra. Since November 2018, the TAMM centres have seen over 107,000 transactions carried out with at least 24,000 customers, according to the latest figures provided by the ADSSSA. “We are pleased with the results achieved by TAMM centres, which reflects the authority’s vision to provide next-generation government services to enhance customer experience that leads to a higher quality of life,” said Dr Rauda Al Saadi, director general of ADSSSA. “The Authority continues to work towards improving the level of government services and to facilitate the customer journey to complete transactions through digital channels in an easy, fast and efficient manner,” she added. Mohammad Al Askar, director of the Government Affairs and Partnership Management Sector at ADSSSA said the authority was keen to provide customers with a unique and different type of experience to what they have been used to when carrying out government related transactions. “When we opened our service centres our vision was to move away from the traditional way of doing things when it comes to accessing government services. From the moment someone steps into a TAMM centre they will see a big difference to the usual reception style offices they have visited before. “Customers will be able to use self service areas, where they can handle any government or private transactions by themselves, or they can choose the one to one area where they will be assisted by employees at the centre to help them carry out their transactions,” he added. Al Askar explained the centres also have an Investors Area, where entrepreneurs and business people can go to when looking to open a new business in Abu Dhabi. 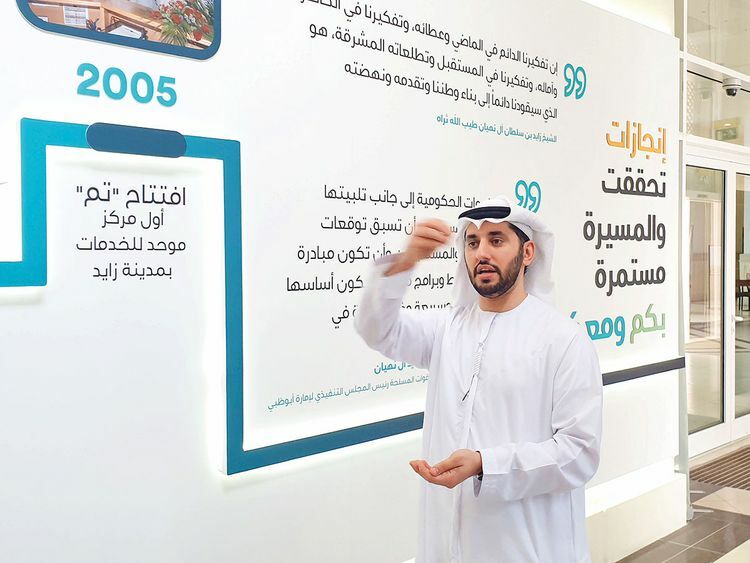 Visitors will also be able to share their opinions and feedback in the Co Create Area according to Al Askar, highlighting how this section will allow constant and open communication between people and government entities. ■ Residents who want to visit any one of four centres in the emirate of Abu Dhabi must first obtain their Smart Pass to be able to access the TAMM portal system. This can be done by either registering at the centre or by registering online (tamm.abudhabi). ■ Once at the centre, visitors will be welcomed and directed to what services they are looking for. Visitors can opt for the self-service option where they can handle transactions by themselves, or they can use the one to one area where employees will assist them with their transactions and enquiries. ■ Services currently covered by TAMM include water and electricity, Mawaqif parking, municipal services, housing, telecom services and Etisalat/Du payments. As all services are accessible from one portal, visitors at the centre will be able to handle transactions covering different government services in one place, saving them the time and the hassle of having to visit several different offices. For example, they can handle a parking issue as well as their water and electricity at the same time in just one visit. ■ Residents don’t have to visit the centres, all of the services are available to them online or through the TAMM app.